Three bloggers in Saudi Arabia have sent the BBC their thoughts on King Abdullah's sweeping government reshuffle. Among the changes announced on 14 February, the King named the country's first woman minister, and replaced the country's top judge and head of the religious police force with more moderate figures. These are the first changes that King Abdullah has made since he came into power in 2005. To understand why the appointment of Nora al-Faiz to deputy minister of Girls' Education is a landmark decision, you have to understand that girls' education is completely controlled by men, as is everything else in Saudi Arabia. Education from first grade up to postgraduate level is completely gender-segregated by law. Women teach and run the schools but when it comes to decisions regarding the curriculums, the uniforms and even the teachers' dress-code, a memo is sent from the men-only administration and principals have to carry them out unquestioningly. So to have a woman head of girls' education is a shock in itself. People wonder what will happen to the hundreds of men working in the ministry. Will they be replaced by women so as to maintain the segregation policy? Or will Mrs Faiz have to conduct all meetings by phone? She has already stated she will not go into any of the male-only buildings. I think this will depend on her personality. Whatever she does will probably become protocol for a long time. When Mrs Faiz's appointment was announced, a photo emerged of her with her face uncovered. This has caused a lot of controversy because of her background. She comes from an average, tribal, middle class family from the central region. One of their traditions is that the women keep their faces covered, especially when they are known by name. When her photo came out it upset these people who make up a large percentage of the Saudi demographic. They started speculating that she might remove the mandatory requirement for students to cover their faces when entering and leaving schools - and that she would be a terrible role model for Saudi women of her own background. Hence Mrs Faiz has had to condemn the photo and the newspaper that published it so as to avoid starting out on the wrong foot. If she had been from the western region or had a foreign mother or even been related to the royal family, she would not have faced this resistance to showing her face. I think the cabinet shuffle was not surprising in itself, but rather in its scale and detail. In areas like education and health care, changes seemed inevitable because despite massive government spending, the public was growing increasingly dissatisfied with their services. The picture is interesting at the ministry of education with three new appointments. The government has been trying to implement a huge plan to reform the educational system, and Prince Faisal bin Abdullah, the new minister, is not just a member of the royal family. He is the King's son-in-law and is said to be very close to him. The change that grabbed the most attention was the appointment of Nora al-Faiz as the new deputy minister for girls' education. Many saw this as a sign of reform as well as recognition of the effort of Saudi women who have worked very hard over the years to help develop the country. Interestingly, Mrs al-Faiz gave a long interview to al-Watan daily last week where she said she was immensely upset because her photo was published in the media. She added that she has no intention of visiting men's office buildings in the ministry. I found her statements strange, but it could be that she does not want to anger the conservatives on her first few days in the job. Many observers believe that the most important aspect of this reshuffle relates to changes in the justice system. We are finally witnessing the end of Sheikh Saleh al-Luhaidan's reign (good riddance! ), which will pave the way for more fundamental reforms in the judiciary. Establishing the new supreme court is a great step in that direction, and hopefully other steps will follow. The cabinet reshuffle was well received here, but I cannot help but sense that some people are being overly optimistic about what kind of change these new appointments can bring. It is usually not enough to change faces, because there is only so much one person can do when you have a system that is dysfunctional and has been like that for years. I was so excited when I read about the changes King Abdullah made to the Saudi cabinet. I felt a joy in my heart that reminded me of the joy I had when Barak Obama was elected US President. Then, I felt that the world was really changing. This time I thought, we are also changing. 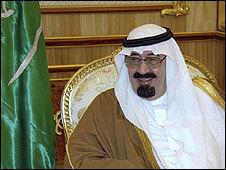 The changes reflect King Abdullah's commitment to projects that he announced when he became King in 2005. King Abdullah has demonstrated he wants to enforce badly-needed changes in the education and judicial systems. The changes in the Ministry of Information, of Health and the Committee for the Propagation of Virtue and the Prevention of Vice also reflect a response to public concern. On the other hand, Saudi citizens are still very much on the receiving end of these changes. We still lack information as to why any minister has been promoted into the Saudi cabinet. I always thought that without the support and involvement of citizens in policy-making, a ministerial reshuffle might not achieve the results we need and are patiently looking for. The Saudi propaganda following the cabinet changes proved once again that the hope of free media in Saudi Arabia is still just a dream. It also enforces the importance of the Saudi blogosphere to show the real hopes and dreams of many normal Saudis. The King's changes have created hope in many Saudi hearts. Such hope needs to be translated into results on the ground. And this hope still cannot make me forget my concerns over human rights in my country. For myself and my kids, I dream of a Saudi Arabia that is transparent and accountable.